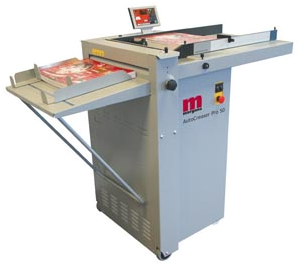 The AutoCreaser Pro 50, made in the UK by Morgana, provides the complete solution to the problem of cracking that occurs when folding digitally printed output. It is equally effective in dealing with conventionally printed card, laminates or cross grained stock. Traditional rotary scoring machines use circular blades that are in constant motion as the stock passes through them. This creates a ploughing action that actually cuts through the top fibres of the paper or card in order to create a score. Inevitably this weakens the paper and encourages cracking. In contrast, the Morgana AutoCreaser Pro 50 employs a unique creasing rule and matrix as illustrated overleaf, that eliminates tearing and, therefore, cracking. The new intuitive 7″ SmartScreen controls all the main functions of the AutoCreaser Pro 50. Using the screen is simplicity itself. Key in the sheet length (popular sizes are pre-set), touch the fold type for the finished product (letter, gate etc) and press the green button. The AutoCreaser Pro 50 will automatically calculate where the creases need to be and set them accordingly. Any minor changes to the crease position can be made by touching an arrow in the relevant direction. The productivity of the AutoCreaser Pro 50 has been improved with a massive 30% increase in speed with no loss of accuracy. Now running at 8,500 8.5″ x 11″ sheets per hour, and an astonishing 11,000 6.5″ x 8.5″ sph this is our most productive creaser to date. The increased sheet size of 27.5″ x 19.6″ can be extended with an optional tray making sheet lengths of 35.4″ possible. The AutoCreaser Pro 50 has the new Morgana PosiFeed feeding system. The drum stops as the vacuum pulls the sheet down before the drum starts to feed. This significant change will enable the feeder to be piled higher and feed the most difficult of stocks. All settings and adjustments are made using the new SmartScreen and as only symbols are used, operation couldn’t be simpler. An alpha-numeric memory allows an unlimited number of jobs to be stored and named as you choose. This makes job recall much easier as you can use your own job name and numbers for storage. An alpha-numeric memory allows an unlimited number of jobs to be stored and named as you choose. This makes job recall much easier as you can use your own job name and numbers for storage. Any changes to the suction drum, feed method, crease position and engineering settings are all made through the SmartScreen which we have developed and designed to make the AutoCreaser Pro 50 the easiest machine to operate whilst offering levels of sophistication never before seen at this price point. Perforation comes as standard on the AutoCreaser Pro range with a wide variety of wheels available to suit all applications.